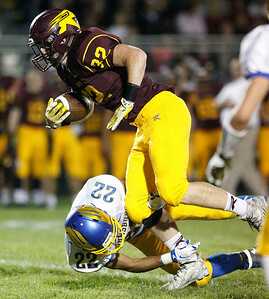 Matthew Apgar - mapgar@shawmedia.com Riley Fritz of Richmond-Burton pushes past Connor Bell of Johnsburg during their football game on Friday, Sep 25, 2015 at Richmond-Burton High School in Richmond. 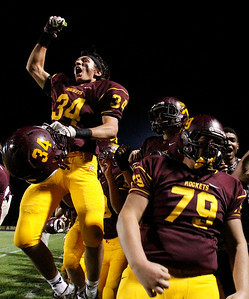 The Richmond-Burton Rockets won the game 29-22. 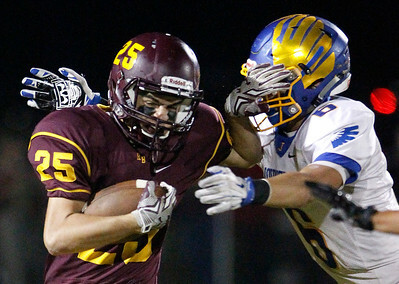 Matthew Apgar - mapgar@shawmedia.com Richmond-Burton's Joseph Wolfram runs the ball through Anthony Moore, left, and Austin Butler of Johnsburg during their football game on Friday, Sep 25, 2015 at Richmond-Burton High School in Richmond. The Richmond-Burton Rockets won the game 29-22. Matthew Apgar - mapgar@shawmedia.com Richmond-Burton's (from left:) Samuel Battalini, Ryan Curran, Andrew Maier, and Eric Guenther celebrate in the final seconds of play against Johnsburg during their football game on Friday, Sep 25, 2015 at Richmond-Burton High School in Richmond. The Rockets won the game 29-22. 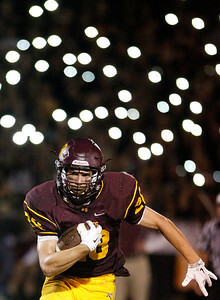 Matthew Apgar - mapgar@shawmedia.com Richmond-Burton's Joseph Wolfram runs for a gain of yards against Johnsburg as fans illuminate the the backgroundduring their football game on Friday, Sep 25, 2015 at Richmond-Burton High School in Richmond. The Richmond-Burton Rockets won the game 29-22. Matthew Apgar - mapgar@shawmedia.com Richmond-Burton's Jesse Hill-Male leaps over teammate Henry Kranz to gain yardage against Johnsburg during their football game on Friday, Sep 25, 2015 at Richmond-Burton High School in Richmond. 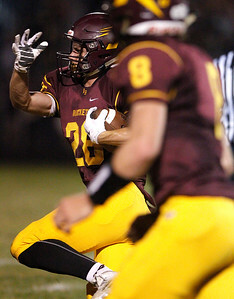 The Richmond-Burton Rockets won the game 29-22. Matthew Apgar - mapgar@shawmedia.com Richmond-Burton's Samuel Battalini, left, Ryan Curran, bad, and Andrew Maier, right, celebrate in the final seconds of play against Johnsburg during their football game on Friday, Sep 25, 2015 at Richmond-Burton High School in Richmond. The Rockets won the game 29-22. 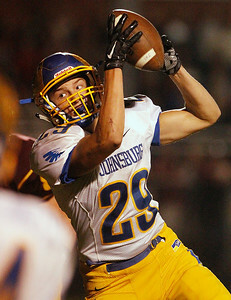 Matthew Apgar - mapgar@shawmedia.com Chuck Curry of Johnsburg makes the catch against Richmond-Burton during their football game on Friday, Sep 25, 2015 at Richmond-Burton High School in Richmond. The Richmond-Burton Rockets won the game 29-22. 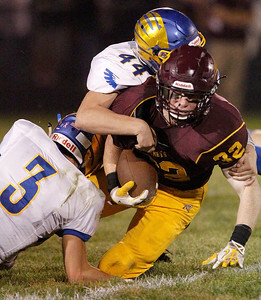 Matthew Apgar - mapgar@shawmedia.com Richmond-Burton's Joseph Dittmar runs the ball as Johnsburg's Anthony Vallone makes the tackle during their football game on Friday, Sep 25, 2015 at Richmond-Burton High School in Richmond. The Richmond-Burton Rockets won the game 29-22. 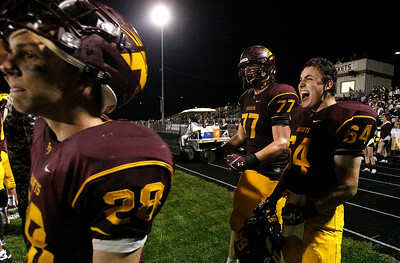 Matthew Apgar - mapgar@shawmedia.com Richmond-Burton's (from left:) Joseph Wolfram, Dalton Wagner, and William Zaremba celebrate in the final two minutes of play against Johnsburg during their football game on Friday, Sep 25, 2015 at Richmond-Burton High School in Richmond. The Richmond-Burton Rockets won the game 29-22. Matthew Apgar - mapgar@shawmedia.com Fans walk through the parking lot to the Richmond-Burton versus Johnsburg football game on Friday, Sep 25, 2015 at Richmond-Burton High School in Richmond. 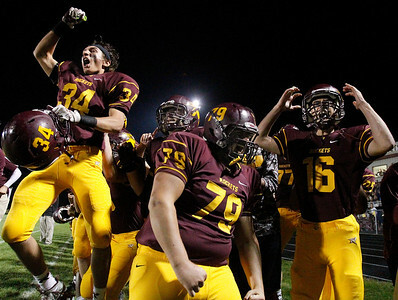 The Richmond-Burton Rockets won the game 29-22. 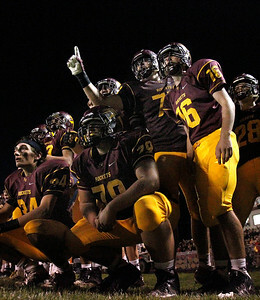 Matthew Apgar - mapgar@shawmedia.com The Richmond-Burton Rockets watch intently as their defense prepares for a vital stop against Johnsburg during their football game on Friday, Sep 25, 2015 at Richmond-Burton High School in Richmond. 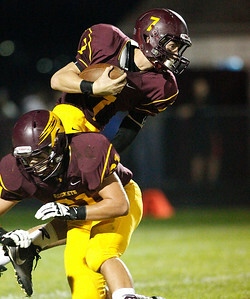 The Richmond-Burton Rockets won the game 29-22. Matthew Apgar - mapgar@shawmedia.com Alex Peete of Johnsburg, front, raises his helmet with his teammates after the national anthem prior to their football game on Friday, Sep 25, 2015 at Richmond-Burton High School in Richmond. The Richmond-Burton Rockets won the game 29-22. 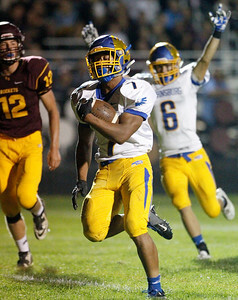 Matthew Apgar - mapgar@shawmedia.com Alex Peete of Johnsburg runs the ball into the end zone for a touchdown against Richmond-Burton during their football game on Friday, Sep 25, 2015 at Richmond-Burton High School in Richmond. The Richmond-Burton Rockets won the game 29-22. 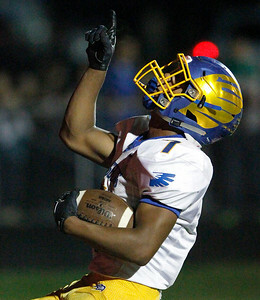 Matthew Apgar - mapgar@shawmedia.com Alex Peete of Johnsburg celebrates a touchdown against Richmond-Burton during their football game on Friday, Sep 25, 2015 at Richmond-Burton High School in Richmond. The Richmond-Burton Rockets won the game 29-22. 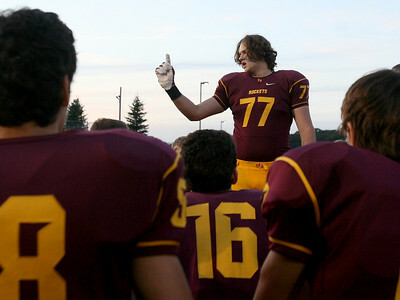 Matthew Apgar - mapgar@shawmedia.com Dalton Wagner of Richmond-Burton talks with the Rockets before the take the field against Johnsburg for their football game on Friday, Sep 25, 2015 at Richmond-Burton High School in Richmond. The Richmond-Burton Rockets won the game 29-22. 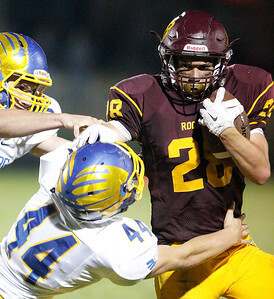 Matthew Apgar - mapgar@shawmedia.com Joseph Dittmar of Richmond-Burton is stopped by Austin Butler, top, and Luc Lindal, left, of Johnsburg during their football game on Friday, Sep 25, 2015 at Richmond-Burton High School in Richmond. The Richmond-Burton Rockets won the game 29-22. 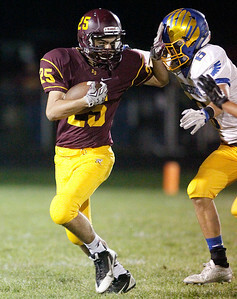 Matthew Apgar - mapgar@shawmedia.com Joseph Wolfram of Richmond-Burton runs the ball downfield against Johnsburg during their football game on Friday, Sep 25, 2015 at Richmond-Burton High School in Richmond. The Richmond-Burton Rockets won the game 29-22. 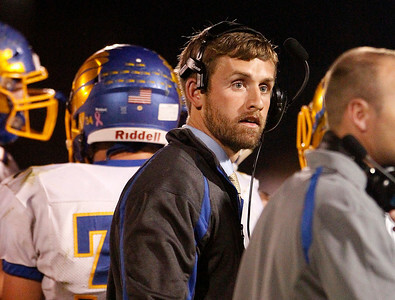 Matthew Apgar - mapgar@shawmedia.com Johnsburg coach Dan DeBoeuf watches on the sidelines during their football game against Richmond-Burton on Friday, Sep 25, 2015 at Richmond-Burton High School in Richmond. The Richmond-Burton Rockets won the game 29-22. 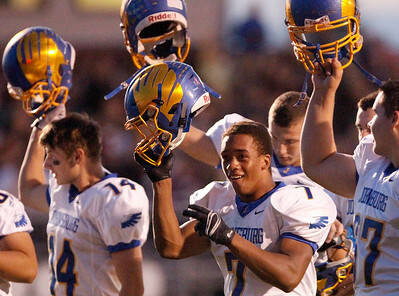 Alex Peete of Johnsburg, front, raises his helmet with his teammates after the national anthem prior to their football game on Friday, Sep 25, 2015 at Richmond-Burton High School in Richmond. 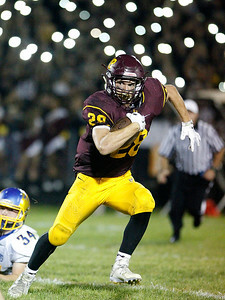 The Richmond-Burton Rockets won the game 29-22.